Licensing Works! 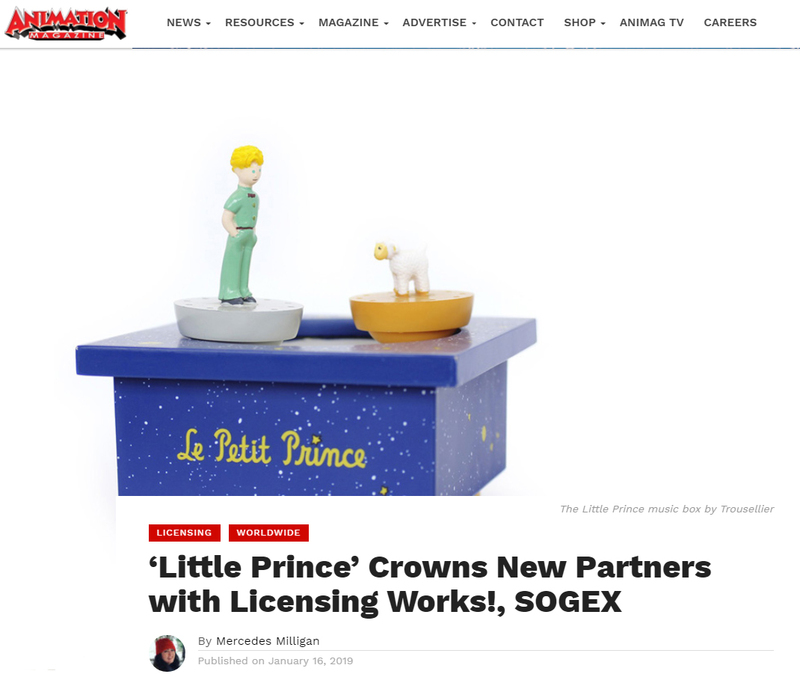 and SOGEX, the global licensor for all rights in and relating to The Little Prince/Le Petit Prince, have entered into a new agreement for Licensing Works! To continue to represent the brand in North America. This follows the successful execution of the 75th Anniversary program in a broad array of product categories, supported by press, promotions and events. NETGEAR kicks off 2019 with a signature content collaboration for its Meural platform. Inclusive of classic and contemporary art packs as well as a custom interactive “story”, fans can experience the beloved brand on Meural’s cutting-edge smart art frame, and interact with the content using gesture control, voice control, mobile app, or web. Product is available beginning in February at Meural.com. Soxnet brings women’s and children’s sock sets to market, including traditional knit and digitally-printed designs. Styles will be available beginning mid-February on Amazon.com. Sack Me! launches three styles of plush security comforters based on the best-known characters in The Little Prince. Available at SackMe.com.au. Metcolors introduces a line of framed art and decorative pillows to home décor and mass market retailers throughout 2019. Moonlite, the best-selling storybook projector, is pleased to introduce The Little Prince and The Fox and the Rose – A Story of Friendship, in an exclusive adaptation of the traditional stories combined with HD projection, sound effects, and read-a-long features, transforming story time into a magical experience. The on-shelf date is February 1, 2019. Available at Target, Amazon, and other retailers. Finn and Emma introduces a beautiful collection of socially responsible and heirloom quality infant and toddler apparel, bibs, teethers and blankets. First available at Macys.com, specialty boutiques and at FinnandEmma.com first quarter 2019. Pickatale, a leading name in learn-to-read apps, is adding several The Little Prince titles to its collection designed to help children of all reading levels experience the joy of literacy and increase their skills. Product is available exclusively on their digital platform at Pickatale.com. Golden Bell Studios will be coming back to Earth with The Little Prince. Revisit the timeless story with a new, exclusive card game. Rizzoli, currently out with a 2019 calendar, is finalizing their 2020 calendar featuring The Little Prince. Out of Print introduces a toddler sock four-pack based on top-selling license The Little Prince. Product is available at outofprint.com and specialty retailers. Litographs introduces new pillows and blankets joining their already broad line of unique totes, t-shirts, tattoos and scarves. Pioneering aviator, best-selling writer and humanist, Antoine de Saint-Exupéry wrote The Little Prince in 1943. The story is inspired by Saint-Exupéry’s own experience of being a pilot stranded in the Sahara Desert in the 1930s after a long-distance race. He originally wrote the book for young children, but it resonated with readers of all ages through its messages of respect for humanity, friendship, authenticity, and charity. To date, the book has sold over 200 million copies and has reached more than 400 million readers around the world.